From an outside perspective, the world encasing Ford Mustang culture seems to revolve around racing. The “pony car” craze that the car originally erupted in the mid-‘60s gave birth to many other racing-bred American sports coupes. On the contrary, the segment of automotive culture using air suspension seems to inhabit car shows more frequently than racetracks. As it’s mostly used to lower (or raise) a vehicle to the ideal ride height with the touch of a button, this would normally be the wrong setup for a Mustang with racing coursing through its lineage—that is, unless the air suspension was created with performance in mind. Enter Air Lift Performance (ALP), an industry-leading manufacturer of performance air suspension systems. The parent business Air Lift Company was founded in 1949 as a solution for overloaded vehicles. For the next couple decades, Air Lift springs were used in stock car racing to improve handling and traction at races including Daytona and Darlington. Fast-forward to now, ALP took notes from the company’s early involvement with stock car racing when they created their complete Performance Series kit for multiple applications. They have proven themselves to be a viable alternative to standard coilover suspension setups, by providing a performance-focused ride while enabling the alteration of vehicle ride height with the push of a button. The subject of today’s install is America’s sports coupe, the S550-chassis Ford Mustang. This particular model happens to be Ford’s newest EcoBoost fuel-economy-driven endeavor. Although, despite having half the cylinder count of a stereotypical Mustang, its turbocharged 2.3-liter four-cylinder engine still generates a stout 310 hp. To quote the old adage, “if it looks like a duck, and sounds like a duck,” this iteration of the famous pony car goes like said duck as well. So when it was time to achieve the perfect ride height, the owner didn’t want to sacrifice the speed of his vehicle by nullifying the suspension. Instead opting for the Performance Series air suspension kit from Air Lift Performance. The kit includes 30-level damping adjustable, monotube, threaded body struts with independent ride height adjustment, T6061 red anodized aluminum adjustable camber plates with spherical bearings, and shorter sway bar endlinks to take advantage of the lowest ride height possible. The owner dropped their car off at well-respected local performance shop R/T Tuning for a seamless, worry-free install, and we were there to cover the steps. If the R/T Tuning name sounds familiar, you might remember us having been there for a StopTech brake upgrade a couple years ago. Their lead tech, Pat, has since grown accustomed to me clicking photos over his shoulder by this point, and he was happy to show each step. He laid out numerous parts of the kit for photos including the VIAIR 444C compressor, all of the electrical components for the ALP 3H management system, and the premium ride-height sensors for the kit. After some analyzing of the available trunk space in the Mustang, Pat utilized the cleanly presented installation instructions included with the kit, and got started assembling all of the plumbing fittings for the air lines. The 4-gallon air tank has the possibility to route to multiple compressors, so the unused ports needed to be plugged. He then measured (twice) an acceptable distance for the tank to be mounted on the spare tire cover and started drilling. Next up was the compressor and management manifold, which he felt needed a small piece of wood underneath the carpet to steady the equipment in the trunk. The double bellows progressive rate air springs included with this kit will allow up to a 5.1-inch drop over factory settings, with separate air struts which will replace the OEM gas shocks in the rear. While the front includes similar equipment packaged together into one unit. Once the mounting situation was handled, next on the list was routing all of the new wiring through OEM locations for a clean install. By clipping a small hole in the grommet in the fender, and using a handmade proprietary wire-fishing tool, he was able to pass the management wiring throughout the cockpit and into the engine bay sight unseen. By running the additional wires behind interior panels, and underneath the car’s carpet, there are no visual cues to any kind of alteration inside the car. Even the evidence in the engine bay is pretty scant. With the wiring done, and the interior bits mounted, it was time to attack the suspension pieces. Beginning with removing the factory brakes for additional working space, Pat also detached the OEM gas shocks and springs, which will be replaced. He measured out and drilled a hole in the thick steel of the OEM front sway bar on each side, then ran a tap to thread this new opening. 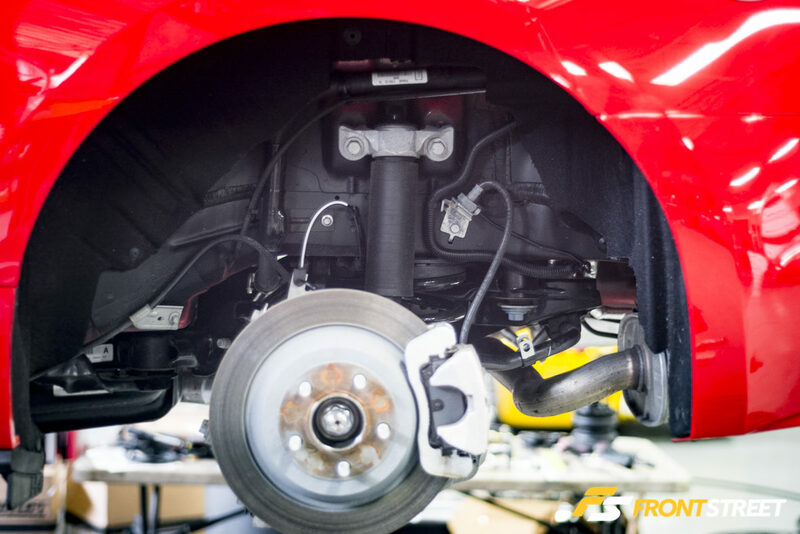 Utilizing factory holes in the chassis, he was able to mount the ride height sensor within a reasonable distance of the sway bar, where he could connect the sensor’s rod to the new threaded sway bar hole. 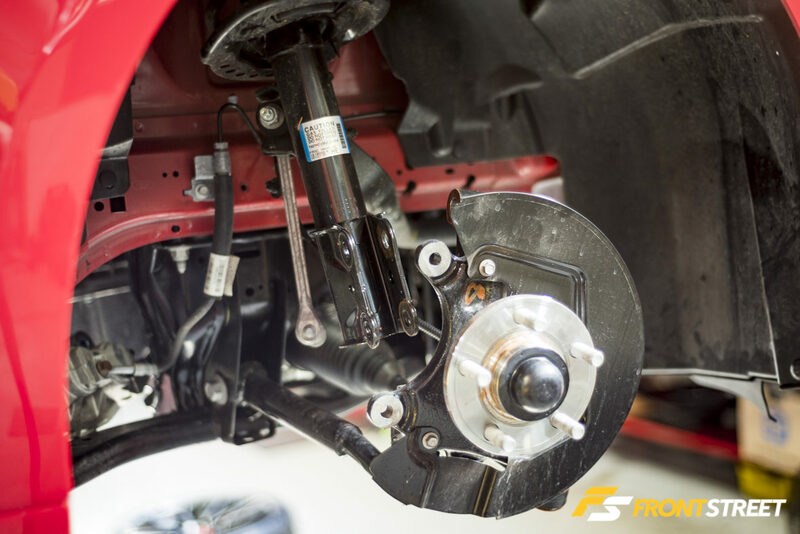 Because the air struts are contained inside one solid package, mounting the front strut and air spring setup is as simple as attaching the new unit to the factory mounting points. Likewise with the shortened sway bar endlinks, just tighten into the factory mounting location. In order to get the most accurate reading on the sensor, Pat simulated where the sway bar’s natural resting place was in relation to the sensor and then trimmed the connecting rod down to fit. This smaller rod will prevent the system from binding at any point of the suspension’s trajectory, while also providing a more accurate readout to the system’s management ECU. With the front passenger side installation now complete, he simply mimicked the same processes on the other side of the vehicle before moving onto the rear. A self-explanatory start in the rear, he began by removing the factory struts, however had to reuse the factory top mount with the new kit. Using a combination of Allen key driver and socket, he tightened the OEM top mount onto the new rear strut without spinning the piston inside. A common error is to use an impact gun to secure this piece on, but this action can cause serious harm to the internals of the strut. Next on the list is the removal of the factory springs. For this, Pat opted to detach every mounting point for the rear lower control arm and spring perch. At which time, the spring didn’t need to be compressed or fought to remove, just simply pulled out. This open area in the rear suspension showcased the location of the ALP-provided threaded washer, which is placed in this opening from inside the car, which the rear air spring assembly is then tightened onto. This mounting along with the supplied lower roll plates will hold the air spring in place despite any excessive movements in the suspension. To complete the rear installation, he simply snugged up all of the previously loosened bolts on the arms, and tightened the new air strut into the factory location on both sides. Amidst the install, Pat decided to reroute the wiring harness in an even more stealth way, by attaching it to factory wires already present through the chassis. With the suspension pieces’ installation completed, he then got to work on running the air lines from the mounted compressor to their corresponding air springs at all four corners of the car. Since the lines will be run underneath the car, in order to properly protect them from the elements he routed and tied them up alongside the factory shielded fuel and brake lines, and wiring harness. Not only making this installation have a clean appearance, but also providing added safety to the otherwise vulnerable air lines. With the installation of all components now complete, Pat torqued the Mustang’s new flow forged Vorsteiner V-FF 107 wheels. Measuring in at 20×10-inch in the front, and 20×11-inch in the rear, the Carbon Graphite color now occupying the wheel wells is the perfect divergence to the Ford’s bright red paint. With the car now at ground level, it was nice to see how the kit wasn’t intrusive to any parts of the interior. By tucking nicely behind the rear seats, the trunk still offers almost all of the usual storage space, and the clean routing of the lines and electrical work makes for an inconspicuous addition. To properly calibrate the sensors on the kit, an installer can use the provided ALP handheld controller, or download the company’s interactive application on a wireless device. Opting for the second choice, Pat ran the system through its introductory diagnostic tests, which looks a lot like someone showing off at a lowrider competition. It purges the air springs at all four corners in different methods and refills them in varying pressures for about 10 minutes or so. Once completed, the system is fully operational and the app transforms into a controller, capable of raising and lowering the car wirelessly. In this instance, there was still an alignment to be completed, so Pat set all of the pressures to the recommended settings, and drove the car onto the rack. Locally well known for performing perfect alignments and corner balancing on all types of performance vehicles (including Formula Drift competitors when the show comes to town), R/T Tuning uses a flat Hunter alignment rack which can handle even the lowest of ride heights. The system uses DSP600 laser alignment discs positioned on each of the four wheels, and measures their relative orientation and position based on the rest of the car. This accurately tells the machine what corrections need to be made to the vehicle’s suspension for optimum readouts. And…Voila! This Mustang, now fitted with performance air suspension, sits in all of its glory. Able to tackle some smooth pavement or easily scale pesky speed bumps at a moment’s notice, this EcoBoost has the best of both worlds equipped to its chassis. No word on whether or not the owner plans to race his car following this install, but he can rest assured his suspension will be up to the task. For more information on R/T Tuning, Air Lift Performance suspension systems, or Vorsteiner wheels, just click on the links provided.